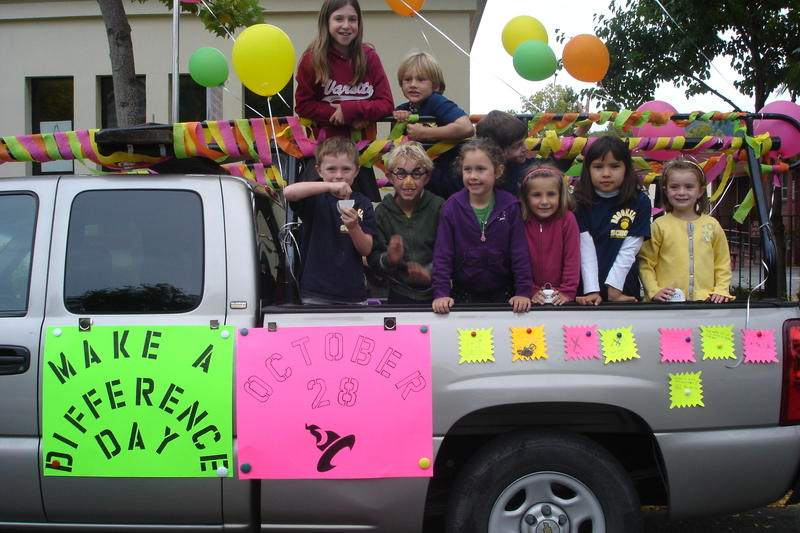 By directly experiencing their own power, our kids learn about civic responsibility and how every good act has a positive effect on their community and ultimately, the world. READ ALL THE WAYS THE 25 CLASSROOMS PARTICIPATED. Here’s how 700 kids made a difference. For Miss Derby’s kindergarten class, the kids drew individual get well cards which were dropped off to the Oakland Children’s Hospital, where they were put on meal trays for the long-term-stay kids at the hospital. The hospital will be sending each of Miss Derby’s students a special badge to help the kids connect with the idea of Make a Difference Day and to help them feel great about their contribution. Miss Coye’s students decided to donate new and gently used sports equipment to Coleman Children’s Center, a local non-profit children’s afterschool care for mulit-age, multi-race San Rafael elementary kids. Miss Coye’s class made a poster with their class picture and signatures on it to send along with the donations. Ms. Maynard’s class participated in Make a Difference Day by adopting an acre of the rainforest for protection! They wrote about the animals they particularly wanted to protect! Laurel Ferrari’s class wrote a Pledge of Peace that they asked other children in the District to sign. They sent them off to the President and local politicians to show that kids can make a difference! They presented this pledge of peace to the local high school. Mrs. Halstenson’s kindergarten class (room 14) had a bake sale with the proceeds going to buying books for a school that didn’t have a library. Mrs. Chartock’s 3rd grade class buddied up with Mr. Lentini’s 5th grade class. In conjunction with the Master Gardener of the Elder’s Garden at Millennium Park, they did some weeding and planting for the garden. 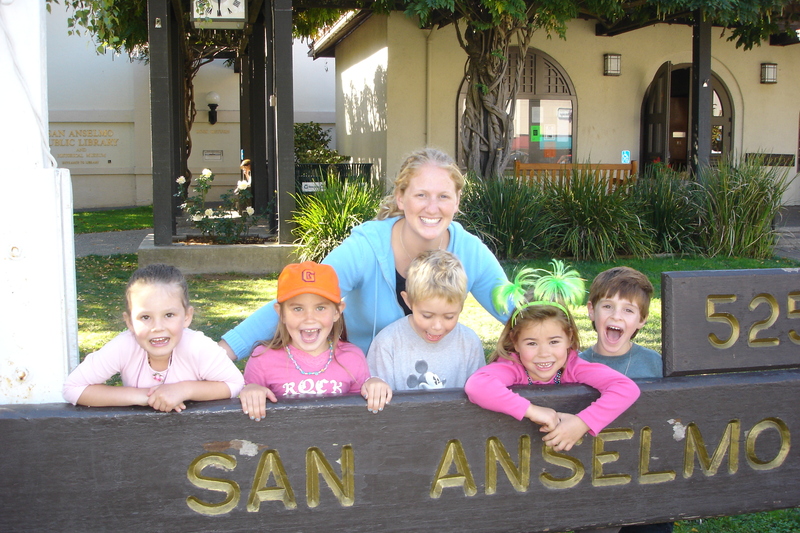 Ruth Leader’s class visited Laurel Dell School in San Rafael to work with kindergartners, first and second graders. Their teachers organized special projects where the visiting students acted act as classroom aides. Additional activities included reading to the students, playing with them at recess and working in the school’s garden. Brookside students also brought extra books from home to donate to the school. Miss Grimes’ 2nd grade class went to Whistle Stop Wheels. The kids made Halloween decorations with the folks in San Rafael–all in an effort to make a difference. Mrs Flemings class collected school supplies to send to Children in Ghana (where Madeleine’s granda (Mrs Rubin) taught school as a volunteer.) The class did a bake sale to cover postage costs. Mrs. Eisinger’s 4th class went to PineRidge Retirement Care Center in San Rafael and did an art/singing program with the residents in the activities room. Mrs. Rogers’ and Mrs Gunnerson’s 1st grade class donated gently loved toys and books to Child Haven, a non-profit organization that serves the children and families of Solano County. These toys and books assist Child Haven in providing therapeutic services to the children and families with which they work. Ms. Derby’s class celebrated Make a Difference Day by sending student letters and artwork to hospitalized children at Marin General Hospital. Ms. Marietti’s classroom visited the retirement community where Joe-the-Crossing-Guard lives and spent time with the residents. Kids collected materials and did an art project in small groups of kids/adults. Room 3 and Ms. Bruners class Room 9, wrote/drew thank you cards for people who make a difference in the community that sometimes get overlooked, like the crossing guards, the lunch ladies, the janitors, the company that sponsors all the sports shirt for soccer teams etc. The Room 10 kids helped out Marin Women’s Services, which runs a few shelters for homeless moms and their children. The agency gave a wish list of needed items to help families establish new lives and homes and kids did “neighborhood” appeals to collect the items. Ms. Kramer’s class celebrated MDD in two different ways; students were encouraged to make a difference with their families and classmates by remembering to use kind words such as “please” and “thank you.” The classroom also wrote letters to soldiers who are stationed abroad in an attempt to brighten their days. Ms. Graham’s class organized a collection of food for the needy of Marin. Mrs. Bishop’s class spearheaded a Room 2 community cleanup effort. The kids identified a local site and removed the litter from the area. Mrs. Dapprich’s class visited the Pine Ridge Care Center where they provided the residents with Halloween cards and conducted a sing-along. The class is planning to return to Pine Ridge in the winter for more interactions and activities that will truly make a difference. Nicole Endriss’s class visited the Rafael Convalescent Hospital, where they had their party in Halloween costumes. Anna Murray’s class paired up with a low-income class in Santa Rosa. Each child donated a new book to a student in that class because many of the students do not have books at home. The class wrote letters and made special bookmarks to go with their books. Mrs. Margetich’s had a bake sale on Saturday at the park to raise money for Drawbridge, a non-profit organization that provides arts program for the homeless.